We haven't talked about sock puppetry here for a long time--i.e. the practice of fabricating identities and using more than one at the same time, to create the illusion of debate or agreement (as the case may be). That's a no-no, in all situations I could have imagined before today. 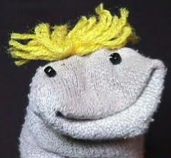 But now I read that the US is deploying sock puppets on social networking sites around the world. All it takes is a few good sock puppets? Servicemen and women will get to have up to 10 identities "based all over the world," but not operating on English-speaking sites or addressing US audiences. So I wonder--why 10? What if a person got to have 20? Would that be like using excessive force? Would it be too psychologically taxing? Is a lean and mean sock puppet force more disciplined, more effective? Just what is the ideal number of sock puppets in the army? Will there be the equivalent of a Seal 6 team, an elite group of puppets that does especially dangerous work? Like, maybe, taking out especially lethal foreign puppets? Actually, I have a great idea. Let's get rid of conventional warfare. Let's do it all with sock puppets!